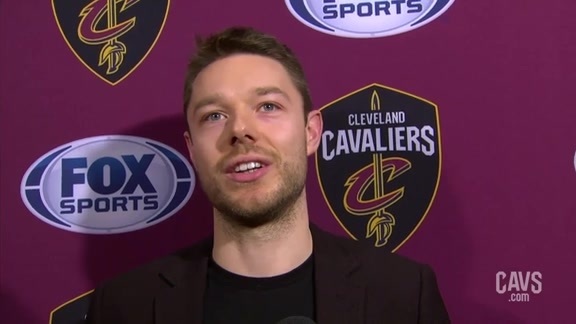 CLEVELAND – The Cavaliers have acquired guard Matthew Dellavedova and forward/center John Henson from the Milwaukee Bucks as part of a three-team trade, Cavaliers General Manager Koby Altman announced on Friday, December 7. As part of the trade, Cleveland is also receiving Milwaukee’s own 2021 first round pick and 2021 second round pick as well as a 2022 second round pick from the Washington Wizards. In exchange, the Cavaliers will send guard George Hill and a 2021 second round pick (Washington’s via Utah) to the Bucks and forward Sam Dekker to the Wizards. In addition, Milwaukee will also receive forward Jason Smith from Washington. Hill (6-3, 188) appeared in 37 games (all starts) for Cleveland after being acquired by the Cavaliers on Feb. 8, 2018, averaging 9.9 points, 2.5 rebounds and 2.8 assists in 27.4 minutes per game over that span. Dekker (6-9, 230), who was acquired by Cleveland on Aug. 7, 2018, played in nine games (five starts) for the Cavs this season, averaging 6.3 points, 3.7 rebounds and 1.22 steals in 18.8 minutes per game. 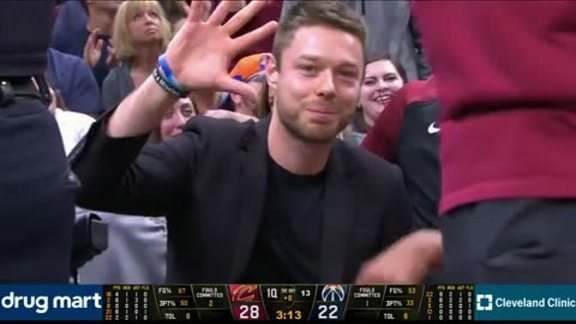 Dellavedova (6-4, 200) played his first three NBA seasons with the Cavaliers from 2013-2016 and was a member of Cleveland’s 2016 NBA Championship team. In 215 career games (31 starts) with the Cavs, he averaged 5.7 points and 3.4 assists in 21.0 minutes per game. Dellavedova ranks ninth in Cavs history for three-point percentage (.398). He appeared in 12 games this season with Milwaukee and owns career averages of 5.8 points and 3.7 assists in 21.4 minutes over 341 games (88 starts) with the Cavaliers and Bucks. Dellavedova will wear jersey number 18 for the Cavs. Henson (6-11, 219), who is in his eighth NBA season, has spent his entire career with Milwaukee, appearing in 405 games (152 starts) and averaging 7.8 points on .539 shooting, 5.4 rebounds and 1.48 blocks in 20.1 minutes per game. This season, he played in 14 games for the Bucks and averaged 5.6 points and 5.1 rebounds in 13.4 minutes per game. He also appeared in the playoffs in four seasons with Milwaukee, playing in 14 games (two starts) and averaging 5.8 points on .536 shooting, 5.1 rebounds and 1.21 blocks in 19.4 minutes per game. Henson will wear jersey number 31 for the Cavs. 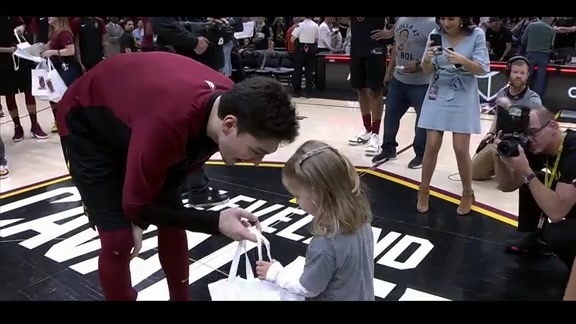 Matthew Dellavedova returned to cheers on Saturday after the Cavs traded for him and John Henson on Friday night. 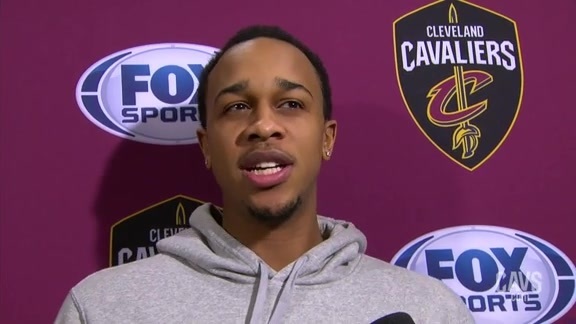 New Cavs center John Henson spoke to the media prior to the game against the Washington Wizards on Saturday. Cavs guard Matthew Dellavedova spoke to the media prior to the game against the Washington Wizards on Saturday.